First, I hope all readers living in Japan are all right after the horrible earthquake, tsunami, and nuclear instability, and that those with friends and family in Japan have made contact with them. Thankfully, my friends and coworkers in Japan are all right, as many of them live south of the devastated areas. My heart and thoughts are with those who were not so lucky. It will probably be a long time before the damage to the country can really be assessed. 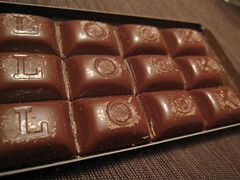 Chocolate and chocolate reviews are definite mood boosters, so I'll get right back on track. Even though I posted reviews of other LOOK assortments first, this is the first LOOK assortment I tried after my long LOOK boycott. 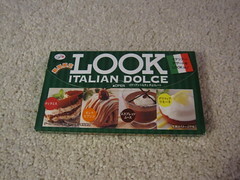 The package contained four flavors: Tiramisu, Mont Bianco, Espresso Mousse, and Delectica Limone. I think that last one is basically a lemon tart. I've always been wary of coffee and espresso flavored candy, but it has been growing on me lately. Delizia Limone seemed like my safest bet, so I started with that. The milk chocolate coating was sticky, but the lemon cream center was tart and cakey with crunchy candy bits. It was really tasty, and my favorite of the bunch. Espresso Mousse had a good, slightly bitter espresso flavor and a truffle-like filling, but it didn't wow me like the lemon flavor did. 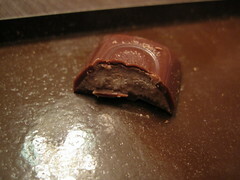 Again, the milk chocolate was sticky and sweet, but the bitter-sweet balance was all right. Mont Bianco was delicious with a delicate chestnut flavor. It wasn't too sweet or too subtle, and it had a very refined feel. It was a close second favorite! Tiramisu was my husband's favorite. Of all the tiramisu chocolates I've tried recently, it was probably the best. Though sweeter that the other flavors in the pack, the mascarpone cheese flavor was just right, and the milky, creamy center was delicious. To sum it up, if you can still find this LOOK assortment, get it! Here are reviews from Japanese Snack Reviews and Sweets Blog. Why the LOOK boycott? I always thought the four-in-a-row variety was a great concept! I tried some matcha LOOK in 2008 and didn't like it at all, so I thought it was a bad brand. I was completely wrong, they do a great job! I think I could have eaten a whole package of that flavor. Thanks for commenting!